Mr Lian has a 2-hectare dragon fruit orchard. “At first, I only put Eco Enzyme in the soil for finding out its effects. To my surprise, the soil became fertile and every plant could produce 40 dragon fruits, each weighed 800 grams, during the season. As a result, the production per hectare reached 1,500 kilograms. Eco Enzyme is very useful for agriculture,” he said. As Yan Ni runs an Internet café, she is always deprived of sleep. That made her face full of pimples. She always felt itchy, painful and her face would bleed if she scratched it. After she started to apply Eco Enzyme on her face two or three times a day, those pimples miraculously started to reduce after a month. Half a year later, those pimple marks on her face became less obvious. 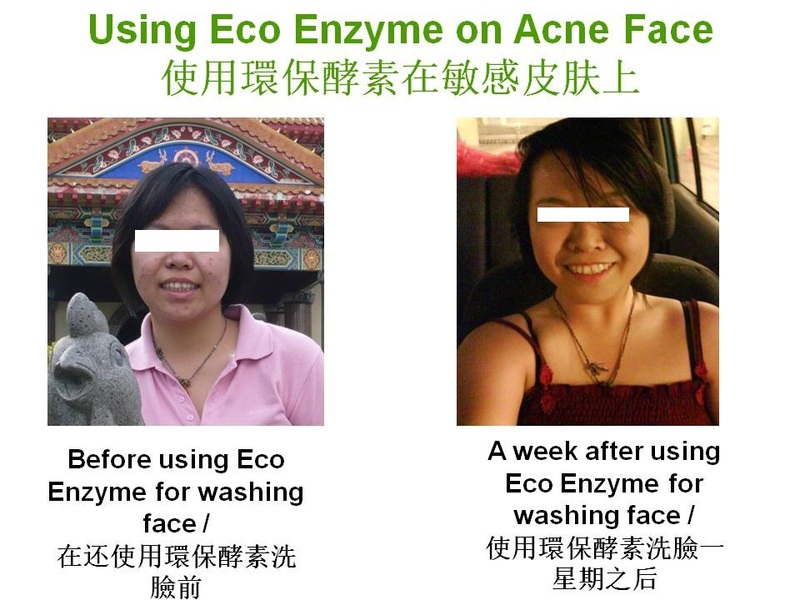 Nowadays, acne is no longer a problem for her because Eco Enzyme has taken case of her trouble. Master Danmela’s house was infested with termites. When he realized it, it was too late. About half of the scriptures in the cabinet had been damaged. As Master Danmela is merciful, he used a vacuum cleaner to remove those termites and released them on a field. Then, he cleanedthe wall and sprayed Eco Enzyme on it. He re-painted the wall after thatand there were no more termites. Zhong Junsheng is seventy years old. People call him “Uncle Chin”. He has had diabetes for 30 years. A few years ago, ulcers started to form on his feet, toes and soles. Pus kept oozing from his wounds daily, and he was in great pain. Doctor Joean advised him to soak his feet in Eco Enzyme. He followed her advice and began to soak his feet in Eco Enzyme for few hours every day. After soaking for a while, his feet would feel comfortable. Uncle Chin said, “The Eco Enzyme for soaking feet can be reused until it becomes dirty.” At present, many wounds on his feet have healed.